We have an small, old, white refrigerator and the way I see it, it couldn't get any uglier besides, having another activity to occupy my daughter is always a plus. Still, if I'm being honest, I did it for me too- I have visions of turning my retro mish-mosh of a "kitchen with potential" into something adorably retro and funky. If I could win some kind of shopping spree at Anthropologie I would outfit my entire home in that store, but as it were I am restricted to the clearance room these days. Still, it's a great place to find inspiration.. 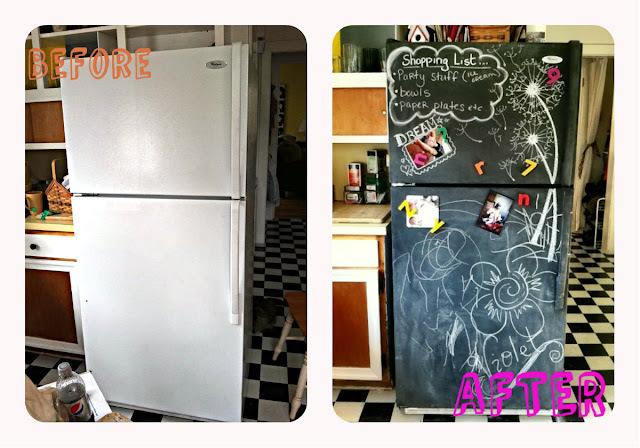 Anyway, as of right now my kitchen is a bit more anth-no than Anthro, but I fully intend to tranform this baby and I have tons of ideas brewing (My Pinterest page devoted to my ideas so far...) When it all comes together, my cute little chalkboard fridge will fit in perfectly. Still, I was apprehensive that it just wouldn't work and that I'd be left with a giant, hulking mess awkwardly occupying my kitchen's focal point. Luckily, nothing gets me more excited than a good artistic challenge. 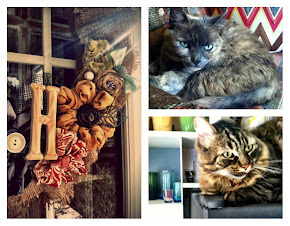 Some research led me to The Handmade Home, an awesome blog that featured the step by step that helped me get started with my own version. Obviously this is not an original idea here, but one thing that sets my experience apart from a few of the others I've come across is that I started with a white fridge and this, my friends, is the biggest issue I had to deal with the whole way through. I found myself wishing many times throughout this project that my refrigerator was black to begin with. There's just a lot of surface area and trim work that I didn't want to paint, but would look strange if left white. I assume with a black fridge it wouldn't be as obvious if some of the interior edges or even the handles were left unpainted. 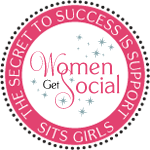 This is something I didn't consider and, though it was by no means impossible, it does involve a few extra steps and a bit more care. - A roller frame and extra rollers (at least one for each paint.) ($5-10) I chose a 1in. roller so that I could fit it between my cabinets and fridge to paint the side. As for the extra rollers, there are ways to store your used roller so it doesn't dry out while you're waiting in between coats, but it's always good to have another one handy in case it does dry. If you're like me and don't have an uninterrupted day to do this project, storing your roller is inevitable. -A small detail brush, about 1in. or less. In my research I didn't find much about surface prep, but common sense says it's probably a good idea to clean any grime off your fridge first. I just sponged it down real quick with some dish soap and water. Next, use your painters tape to cover any brand labels, the rubber seals and any other metal etc. that you don't want to paint. 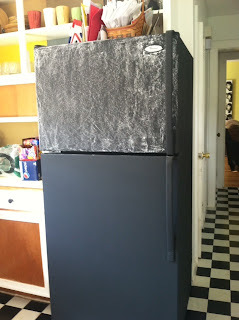 I chose to paint the inner frame of my fridge too because I thought it would just look strange if I didn't. the hardware, rubber and brand. Tape covering the side of the rubber seal. the inside of the seal: BEWARE! frame that I painted. It would just look silly if left white. 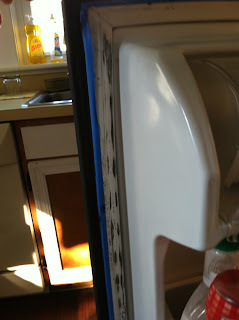 Since you will be painting multiple coats of paint on top of your already magnetic fridge, if you want to retain its magnetism this step is essential. I have heard of people who skipped this step and still had some magnetic cling, my thinking was better safe than sorry. For the most part I followed the directions on the can and waited 1/2 hour between coats so basically if I started with the freezer door and worked down, then moved on to the sides, by the time I was done it was dry enough for the second coat. The image below is after 2 coats of magnetic primer. 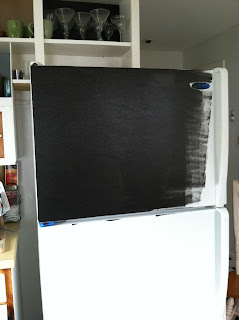 I think the can might even suggest 3, but I am all about cutting corners when necessary and my thinking was, the fridge was magnetic to begin with, so that's kind of like a third coat, right? No? 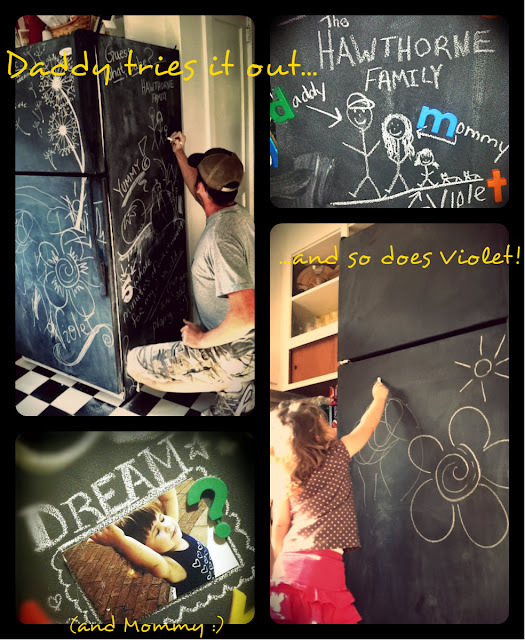 There are tons of options for chalkboard paint out there, from colors choices to DIY mixes from scratch. In case you haven't already noticed, I went with black after much deliberation. I love the old school feel of the green paint too and was really tempted, but in the end I just felt like it went well with the floors (which became an issue in and of itself. Note: At this point I was left the project for a while and eventually came back to it. I tend to have a million projects going at once and am easily bored and distracted by them, if not by my full time teaching responsibilities and other such wifely and motherly duties. 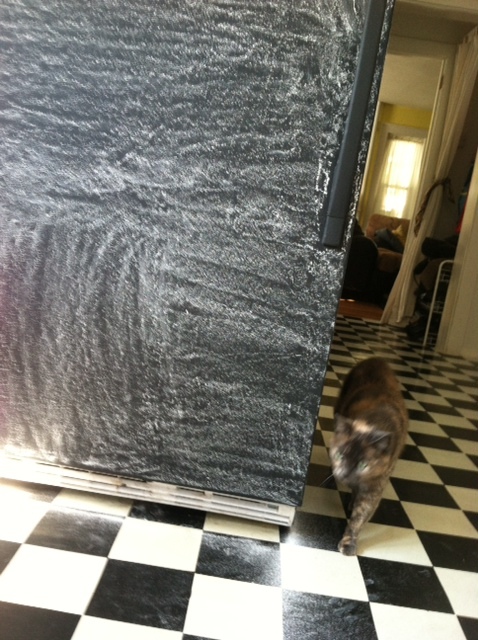 Thus, we lived with the primed fridge for a while and in crept the doubts. At first I felt like made the room feel smaller and darker, but I got used to it after a day. My biggest issue was the texture of the paint. The primer is thick, thick, thick and the finished product was as rough as concrete. In comparison to the smooth surface of your standard refrigerator it's a bit of a change. No big deal if you don't happen to have the world's most clumsy toddler. Bless her little heart, my Violet is the only child I know who can trip over thin air while standing still (admittedly a trait that was inherited from yours truly.) 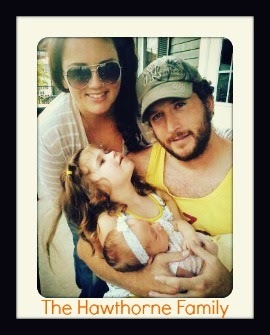 We call her our floppy child. She has her head in the clouds and dances every other step she takes, while stumbling through the rest and we love her for it. Still, you can imagine my trepidation when I realized that we now had a giant cinder block in the middle of our kitchen just waiting to scrape her all up. This is when I did a little experimenting (almost 2 months later.) With a medium weight sandpaper I lightly sanded over the primed surface to see what it would do to the texture. I was pleasantly surprised to feel that the result was much smoother and kid friendly. I have to say, the texture might vary a bit depending on the nap of the roller you use. It's totally your judgement call. I read many a blog where people never mentioned sanding anything and didn't seem to have any issues with a rough surface, but should you have the same experience I did, that is the solution. Ok, now you can crack open the chalkboard paint, I promise. 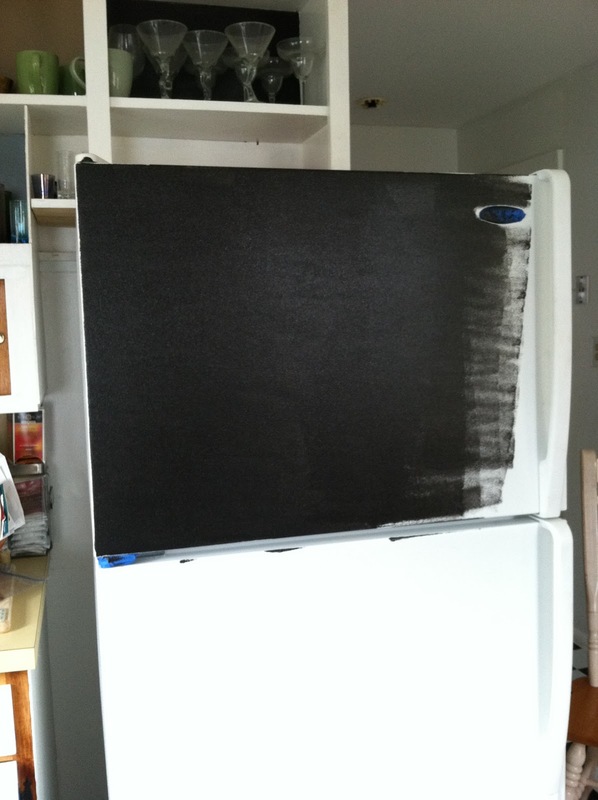 As you might have guessed, a few more months went by before I actually finished 2 coats of chalkboard paint on the whole fridge. As easy as it was to do, life got in the way, but when the time came I rolled it on following the same steps as I did with the primer (1/2 hour between coats is dry to the touch, 2 hours to handle.) In the time that elapsed, sticky finger prints, spills and crayon drawing decorated the primed surface of my household-appliance-turned-craft-project. I quickly wiped them off with a sponge, but some of the stain were more stubborn. I painted right over them and have yet to notice any difference. 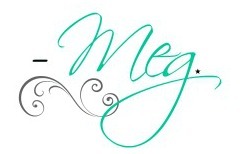 I love the beautiful, matte finish and color of the completed project. So much so that I almost cried when I read about the "conditioning" steps that were suggested before using this lovely new canvas. I considered skipping it, really I did, especially when I saw that Ashley at The Handmade Home never mentioned this messy step. By the time I was finished I had rendered about 3 pieces of chalk mostly useless and had a 1/4 in. thick mound of chalk surrounding the fridge like some barrier against evil spirits or detection device for refrigerator raiders. Not to mention the little cat paw prints and toddler (and adult) footprints scattered around our black and white checked floors. YUP- Was anyone else thinking all along that might be a bad idea with my floors? Because I wasn't. At least not until I noticed said pile and tried to sweep it up. I mean, it's a mess no matter what kind of floor you have, but black and white? Duh. Still, I can honestly tell you it was well worth it. Who am I kidding? My floors are usually a mess anyway, now I just have an excuse! Kiss that pretty, matte black goodbye. I must admit, I was a bit disgruntled after conditioning. I knew that the ever present white haze would mar the surface of my meticulous paint application, but I did find myself wishing I had skipped this all together. Still, after having lived with it for a few months now, to expect it to look even close to pristine when it was done to occupy and 2 year old- that's just silly talk. The reality is that once you do this project you have welcomed the chalk dust into your life, and lots of it. If this project is really going to be worthwhile for you it will be a welcomed distraction every time someone walks by the fridge. My hubby and I have written cute little notes back and forth, I have started a shopping list and sometimes find my self going to the fridge for a snack and ending up sitting on the floor doodling away. Oh I love this! I have pinned it for future reference. I would love to do this to my old fridge. Have a great weekend!